S5 Image and Content Fader - NEW V4! This template has the ability to set the entire width of your set to either a fixed pixel width or a fluid percentage width. You can set the width to any size you want. Be sure to check out the responsive layout page to see how the layout below is constructed on multiple screen sizes. The responsive layout will work with both fixed or fluid settings. Responsive layouts are completely optional. You may also set the widths of the following positions to any width that you need to: left, left_inset, right, and right_inset. You may set them to any width you need to. Columns can either be set to a fixed px width or they can be set to a fluid percentage width. 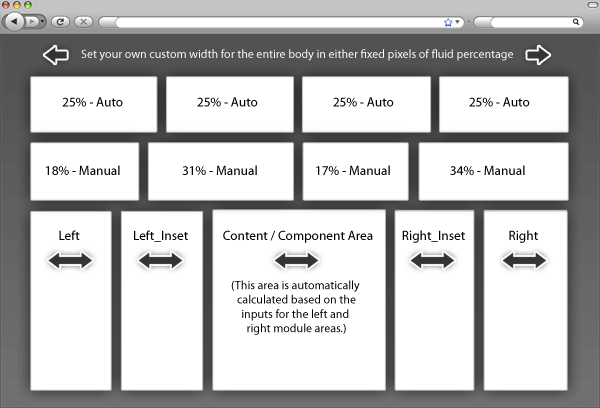 If you are enabling the responsive layout we recommend setting these to percentage width. This template comes loaded with module positions, many of which appear in rows of 6 module positions. Any row that contains 6 module positions can have it's row columns set to automatic widths or manual. For example, in the picture below the first row shows 4 modules published and since it's set to automatic each is set to 25% width. The second row shows a manual calculation for each module in the row. Again, you may do this for any row that contains 6 modules. If you setup a manual calculation they must total to 100%. Not all 6 modules need to be used, as shown below. All of this is done very easily in the template configuration.